In this tutorial, you learn how to create a dataframe from a csv file, and how to run interactive Spark SQL queries against an Apache Spark cluster in Azure HDInsight. In Spark, a dataframe is a distributed collection of data organized into named columns. Dataframe is conceptually equivalent to a table in a relational database or a data frame in R/Python. Complete Create an Apache Spark cluster in Azure HDInsight. Applications can create dataframes directly from files or folders on the remote storage such as Azure Storage or Azure Data Lake Storage; from a Hive table; or from other data sources supported by Spark, such as Cosmos DB, Azure SQL DB, DW, etc. The following screenshot shows a snapshot of the HVAC.csv file used in this tutorial. The csv file comes with all HDInsight Spark clusters. The data captures the temperature variations of some buildings. Open the Jupyter notebook that you created in the prerequisites section and create a new notebook with PySpark. 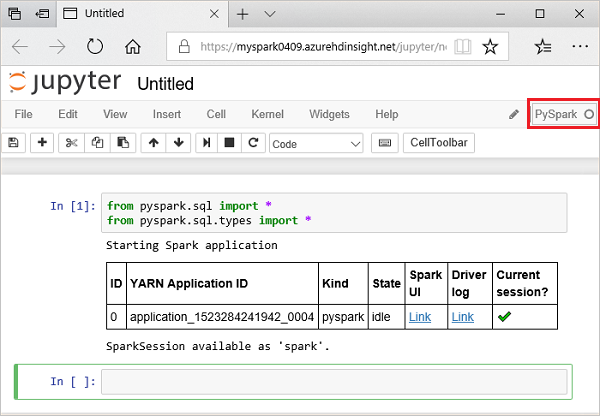 By using the PySpark kernel to create a notebook, the spark session is automatically created for you when you run the first code cell. You do not need to explicitly create the session. When running an interactive query in Jupyter, the web browser window or tab caption shows a (Busy) status along with the notebook title. You also see a solid circle next to the PySpark text in the top-right corner. After the job is completed, it changes to a hollow circle. 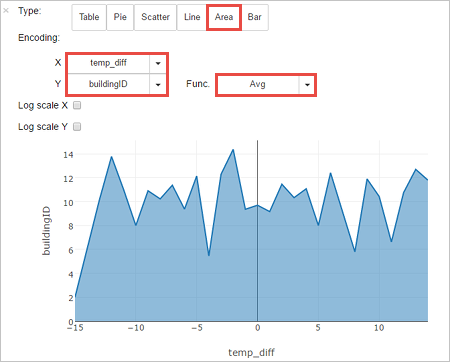 Run the following code to create a dataframe and a temporary table (hvac) by running the following code. 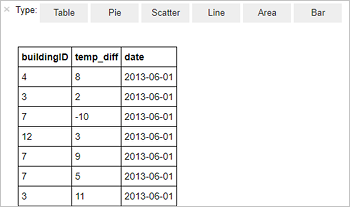 Once the table is created, you can run an interactive query on the data. SELECT buildingID, (targettemp - actualtemp) AS temp_diff, date FROM hvac WHERE date = \"6/1/13\"
The following tabular output is displayed. You can also see the results in other visualizations as well. To see an area graph for the same output, select Area then set other values as shown. From the notebook menu bar, navigate to File > Save and Checkpoint. If you're starting the next tutorial now, leave the notebook open. If not, shut down the notebook to release the cluster resources: from the notebook menu bar, navigate to File > Close and Halt. With HDInsight, your data and Jupyter notebooks are stored in Azure Storage or Azure Data Lake Storage, so you can safely delete a cluster when it is not in use. You are also charged for an HDInsight cluster, even when it is not in use. Since the charges for the cluster are many times more than the charges for storage, it makes economic sense to delete clusters when they are not in use. If you plan to work on the next tutorial immediately, you might want to keep the cluster. Create an Apache Spark dataframe. Run Spark SQL against the dataframe. Advance to the next article to see how the data you registered in Apache Spark can be pulled into a BI analytics tool such as Power BI.